I plan to have one of my good friends over for breakfast and coffee today in celebration of her birthday. I’m making my all-time favorite pastry: cranberry orange scones. She wasn’t available for consultation when it came down to figuring out what to make for breakfast. UPDATE: This post was written before we ditched coffee creamer. Here’s why we no longer drink the stuff, plus some new ideas to flavor coffee. I haven’t always been a pastry-making-momma. I don’t have one of those pastry blender thingies that recipes say to use, so on my first pastry recipe I tried using two forks. Fail #1. On the second recipe I tried using a whisk. Fail #2. For the third, two knives. Fail #3 and a “you win” to the butter. For years I avoided all recipes involving a step to “cut in the fat” and that was just fine with me. Having to “cut in the fat” was scary and intimidating! Until one day Mr. Crumbs REALLY wanted biscuits. Running out to buy Bisquick or Pillsbury or ANY instant biscuit for that matter wasn’t an option. I begged and I pleaded – please don’t make me cut the fat! I can’t do it! I’m SO BAD at it! I got the puppy eyes in return and caved. Fine. I’ll cut the fat. I knew that forks, whisks and knives were no match for this cold butter, so I had only one option left: my bare hands. I squeezed and squished the butter, quickly and carefully tossing it with the flour in order to follow the “don’t create a paste or let the butter melt!” order that recipes barked at me. A couple minutes later yielded me with a mixture that resembled breadcrumbs – SUCCESS! The biscuits were delicious (and by far the best biscuit EVER according to my husband) and I had overcome my fear of cutting in the fat. Take THAT butter! Ha HA! 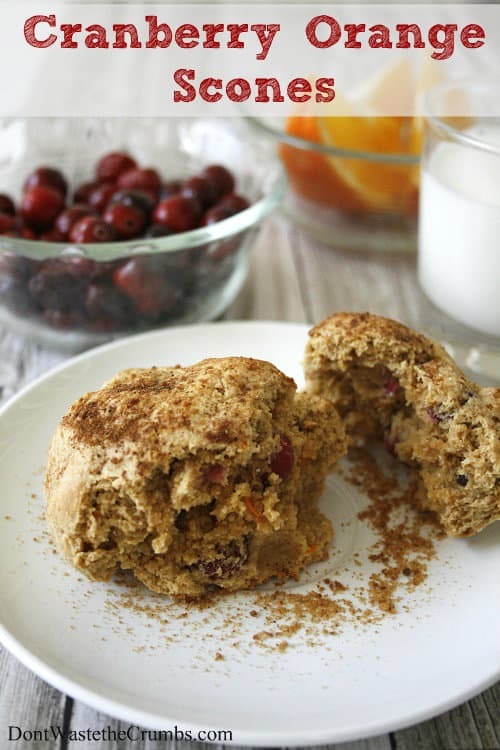 This cranberry orange scones recipe is absolutely delicious and suitable for both those who are cutting-the-fat-challenged, and those who have mastered it. I always use fresh cranberries (frozen and leftover from Thanksgiving) and orange juice concentrate (because it’s easier to have on hand than orange zest). Serve with fresh hot coffee and enjoy! In a large bowl, whisk together flour, sugar, baking powder and salt. When the mixture looks like coarse breadcrumbs, add in the cranberries and orange zest and toss to coat with flour. Whisk the egg and cream together in another bowl and add all at once to the flour mixture. Mix gently with a spatula until it becomes gooey, then form the mixture into a ball using your hands and knead it gently against the sides and bottom of the bowl (5-10 times or so), taking care not to squish too many cranberries in the process. You want a good looking ball of dough in a bowl that's fairly clean. Break off a small fistful of dough, shape into a ball and place onto an un-greased cookie sheet. Leave about 2 inches between each ball for expansion. Brush the tops with cream/milk and sprinkle cinnamon and sugar on top. Bake for 12-15 minutes, or until the cranberry orange scones are golden brown along the edges. * If you're challenged at cutting in the fat too, leave out the butter and egg and increase the heavy cream to 1 cup. * Another fun variation is to use eggnog in place of the heavy cream. Follow the original recipe for a hint of 'nog flavor, or use the variation above for a full-bodied eggnog scone! I have to say they are truly delicious scones and I am so glad you overcame the cutting-the-fat- challenge! Thank you for such a special message and for being a wonderful friend! You truly are a wonderful caring person and I cherish you and our friendship! I’m so glad you liked them! Happy Birthday! yum! i want these. now. How much orange juice concentrate do you use? Thanks! Sorry about that Jenny! I use approx 2 tsp. I’m going to try these tomorrow. My grocery store used to have them between Halloween and New Year’s and now they only have them two weeks before Halloween. I haven’t been happy since they made this change. Blueberry or Pumpkin are NOT an acceptable substitute. I agree. Hope you can find enough cranberries to stock up on!